The faces tell the story. 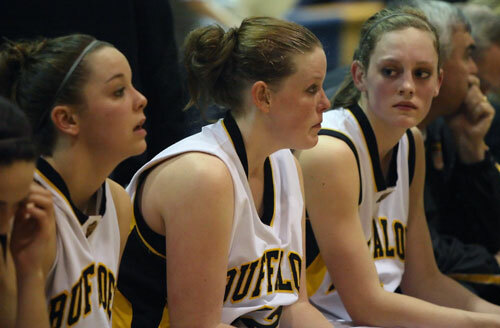 The Floyd County Lady Buffaloes fell to Radford 58-54 in the Three Rivers District final Friday night at Christiansburg High School. Radford came out swinging, scoring first and taking the lead before the Lady Buffs fought back and lead by 9 points at the half and, at one point in the second half, led by 12 points. But, with the game tied at 54 apiece and less than a minute left on the clock, Radford scored and then Floyd County fouled, allowing the Lady Bobcats to rack up a four-point lead with just four seconds to go. The loss, however, does not eliminate the team from the playoffs. They hed into the regionals Tuesday as the team to beat and open the regional tournament at Floyd against a team to be determined over the weekend. Let’s remember that the Lady Buffs lost out in the first round of the district tourney last year and went on to win the state championship.